Hey Doodlebug friends! It’s Traci … back to share my Home Run project with you. 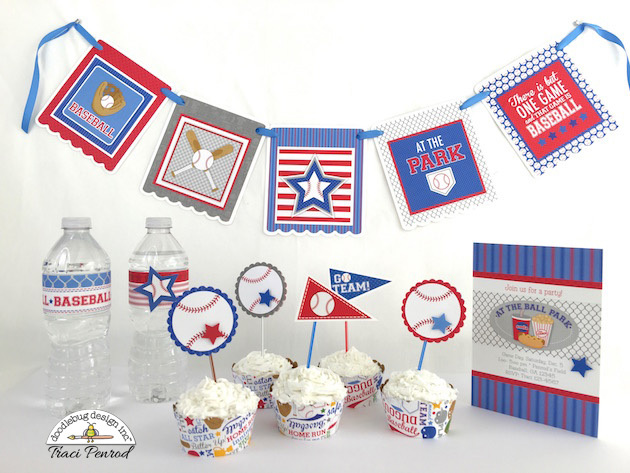 Do you have a baseball fan in your family? 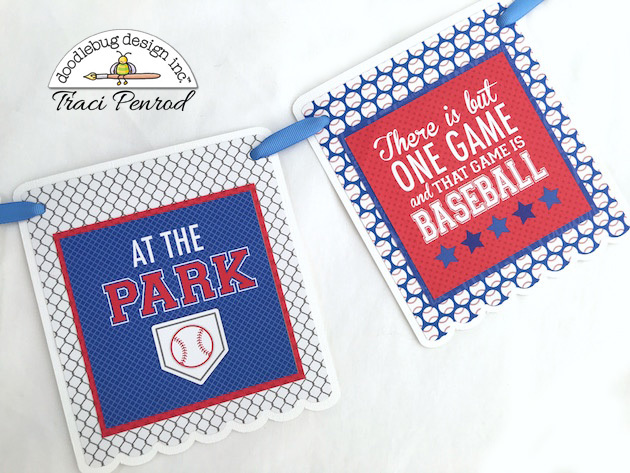 If so, Doodlebug’s new Home Run collection is perfect for all of your baseball themed projects. I made this set of party decor … great for birthdays or team parties, and really easy to create! First, I used my CAMEO machine to cut 5 cupcake wrappers (link to cutting file) out of the adorable ‘Play Ball’ paper. I was able to get 5 on one sheet of 12×12 paper, and they stay together without adhesive … super simple! 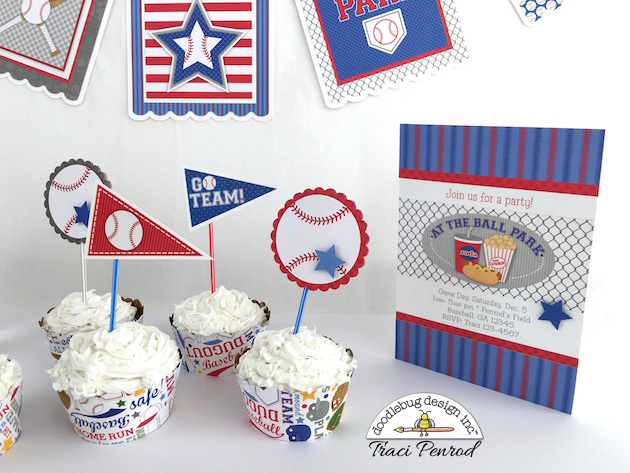 Next, I used the baseball’s from the Die Cut package, a few pennant stickers, and Doodlebug pixie sticks to create some adorable cupcake toppers. Again, very easy! The toughest part was making the cupcakes! 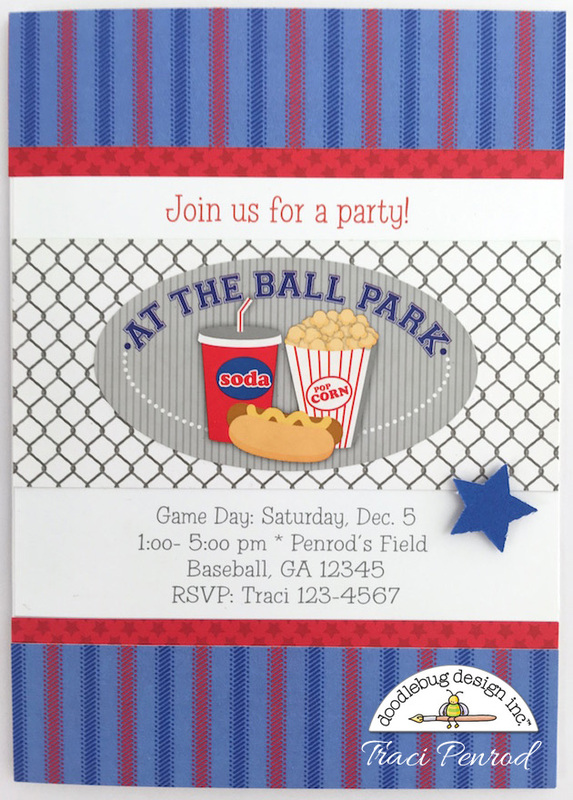 For the invitation, I layered pattern paper from the 6×6 paper pad to the front of my card base, printed my party details, and added the “at the ball park” sticker. This would be such a fun invitation to receive in the mail! For my banner, I used my CAMEO to cut a banner designed by Lori Whitlock (link to cutting file). I shortened the banner so that 4×4 cards from the collection would fit nicely on each (the white base is 5.5″ x 6″). I layered paper from the Home Run 6×6 paper pad, punched a few holes, and added ribbon. I love how fun and easy this banner was to make! Finally, I wrapped a few strips of paper from the ‘baseballs’ paper around some water bottles and added a few stickers using foam adhesive. Doodlebug knocked it out of the park with this collection!! I love it!